Use this feature to streamline the shopping cart by minimizing data entry and providing an optimized ordering experience for customers. This feature requires that the use of the SHORT_FORM parameter in Buy links. Note: SHORT_FORM parameter is case sensitive. Available by default to all 2Checkout accounts. Navigate to the Generate Links area. Check the checkbox for the Compact shopping cart fields option when generating your Buy Link to minimize the number of mandatory cart fields shoppers need to fill in during the purchase process. This action will automatically add SHORT_FORM=1 to generated Buy Links. Add the SHORT_FORM=1 parameter manually to Buy links after you generate them. Case sensitive. Include SHORT_FORM=1 in buy links for shopping carts. When the feature is active and SHORT_FORM=1 used in buy links, the name, email, ZIP code and country pair become the only required aspects of the billing address. Note: Using the SHORT_FORM=1 parameter without the feature being enabled for your account will result in shoppers following the classic purchase flow, where all billing address data is mandatory. Will need to fill in only the country and ZIP code (if it applies), necessary for VAT/tax calculation. The name, email, ZIP and the country are the only remaining address elements still mandatory. Note: Shoppers in the U.S., Puerto Rico and Marshal Islands are required to provide a valid ZIP code for their location. The same requirement does not apply to shoppers worldwide. Will no longer need to fill in the address information as the field is no longer mandatory. 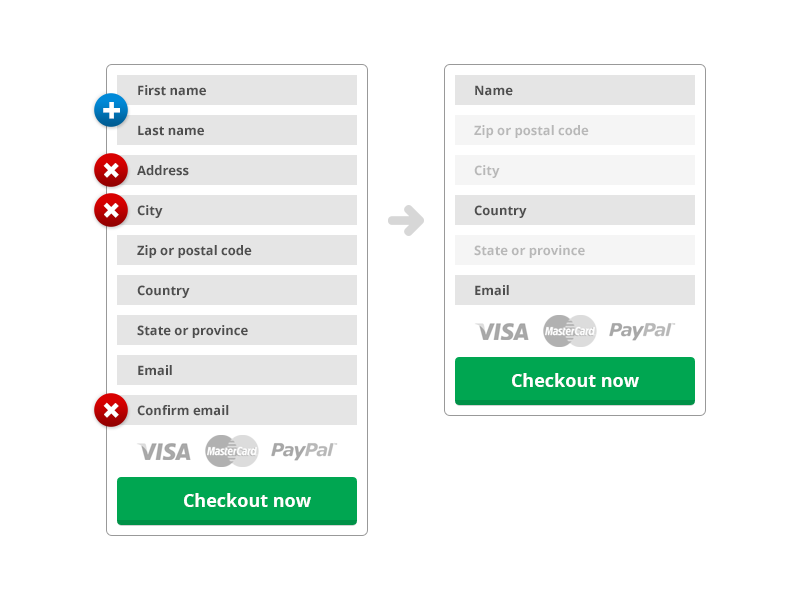 In fact, the address field doesn't need to be included in the cart design. Becomes part of the Name field. Used for tax calculation. Shoppers from the U.S., Puerto Rico and Marshal Islands are required to provide a valid city code for their location. Used for tax calculation. Shoppers from the U.S., Puerto Rico and Marshal Islands are required to provide a valid ZIP code for their location. Used for tax calculation. Shoppers from the US, France, Romania, Brazil, Canada, India and Turkey are required to provide their state or province during the checkout process. 2Checkout performs checks designed to ensure that the ZIP code provided by customers is valid. Taxes are calculated after a valid ZIP code is provided, and if necessary, added to the value of the products in the cart. Is there any information included automatically for addresses? A dash "-" is used for the address. Is SHORT_FORM supported in the 2Checkout mobile shopping cart? Yes, you can use the URL parameter to optimize both the desktop and the mobile versions of the 2Checkout shopping cart. Does it work for trials? Yes. SHORT_FORM is supported in scenarios in which your customers access trials for which they need to provide billing details and payment information. Is it included in hash validation? No. SHORT_FORM is not included when creating the hash for buy links.